Miguel Vallinas Prieto, an advertising and industrial photographer, spends much of his time on his personal work studying the landscape, the meaning of pure nature, cityscapes, contemporary architecture, portraits, etc. In his photographs he tries not to leave room for improvisation by performing a preliminary study of the place, the light, of all those factors. His work is a search for beauty understood through his eyes, his perception. Roots is the third of a photography series that follows up Skins: a previous reflection about identity, existence and individual choice. 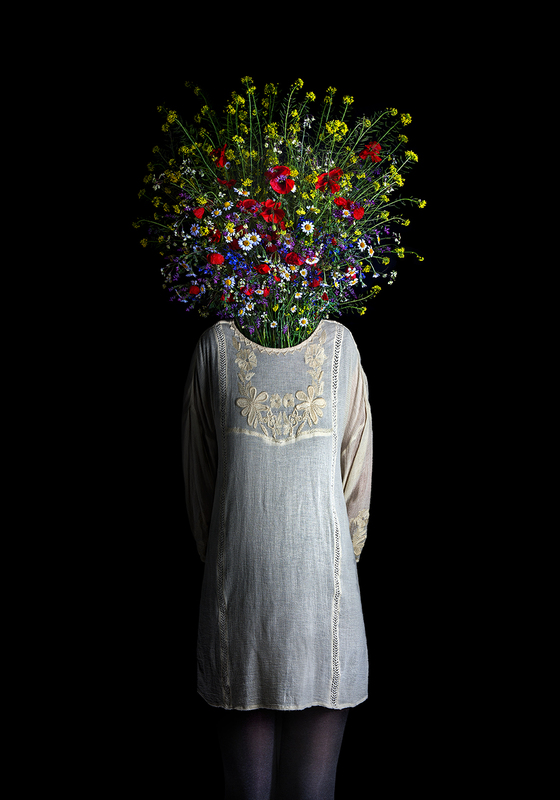 The photographs show bodies with seasonal plants and floral bouquets replacing human heads. The human body represents the stem, and the head represents the flora, while the hidden root is linked to the earth: the starting point and destination, the beginning and end of life. The root is the base of our existence that guides the direction of our path. The term root indicates belonging, bonding, base, and nourishment. In the present collection there is an initial search for identity. It is added to the human context whether that is social, cultural, economic or familial. This concept indirectly determines human choices and the search for the authentic self. The photographs uncover a specific image through the plants and flowers that show the present moment. It may be current time or a defined time, or perhaps it represents only what we wish to show, which is not what we really are. It is interesting how this collection’s title points precisely to the unseen element but nevertheless represents the support of the self; therefore all the photographs are shot from a mid-plane-take, hiding the lower part of the stem from which the roots start. Root searches once more in human nature for “what we believe we are, what others think we are, what we really are and what we would like to be”, demonstrating that there is a reason for these beings to sprout from the root. Root is the third of four photographic series that reflect on the questions surrounding human choices to confront the real self, the self that could be myself, and the self that is definitely myself.